Are you looking for a way to add interest to your Colonial America / Revolutionary War unit? Do you want to add more activities to your learning stations? Are you searching for a project which integrates learning and technology? Download my Revolutionary War Trading Cards package! Included is a set of 54 trading cards highlighting famous persons, places, events and documents of the Colonial America and Revolutionary War periods. These trading cards can be printed on card stock, laminated, and trimmed to produce a set of playing cards. The deck is divided into fours suits of thirteen with two jokers, allowing students to learn while playing any standard card game. Also included are the documents "Educational Trading Card Games" and "Creating Educational Trading Cards". The first document contains three original study games for classes and small groups. The second document gives teachers and students the step by step instructions required to create their own cards using an online resource. Enjoy! Excellent resource for our 4th grade unit on Colonial America & The Revolutionary War! 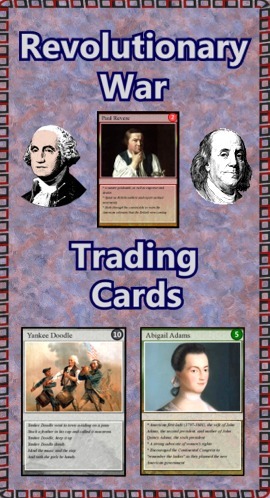 One of my reading groups will use the "create a trading card" activity as an extension to our Revolutionary War unit. 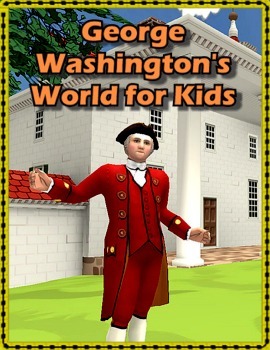 This site reintroduces children to Washington as a bold, ingenious man of action, and Mount Vernon as his beloved home. After playing the games, children should feel newfound appreciation for Washington, and a familiarity with his Mount Vernon estate. With these goals, we developed three learning games that explore different aspects of Washington's life and achievements, from farmer to soldier to statesman. 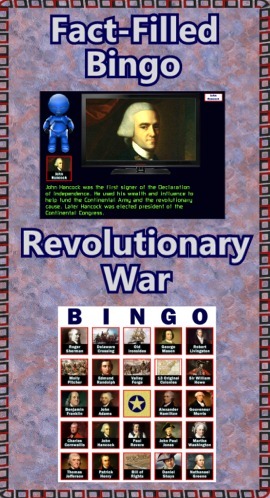 "Fact-Filled Bingo" is a computer program sure to bring excitement to your Revolutionary War unit. Instead of numbers, the talking robot calls out random persons, events and documents complete with pictures and interesting facts. Forty bingo cards suitable for laminating are provided. Also included is the computer program “Fact-Filled Slideshow”. Hook up your classroom PC/Mac to a SmartBoard or projector to highlight 48 different persons, events and documents. Again the talking robot does the narrating. Ideal for projects where students select a topic to research. Both programs use text-to-speech technology to make the robot speak. As a bonus I’ve included the manual “Text-to-Speech” which teaches you how to make your PowerPoint presentations talk. A free online utility accepts your text and coverts it to a sound file, which in turn can be imported into slides. Ideal for the computer lab!